This post was contributed by Professor Jacqueline Barnes, Department of Psychological Sciences. The risk of children having unintentional injuries requiring medical attention or being admitted to hospital both declined with increasing maternal age. For example, at three years the risk of unintentional injuries declined from 36.6% for mothers aged 20 to 28.6% for mothers aged 40 and hospital admissions declined, respectively, from 27.1% to 21.6%. The rate of complete immunisations by three years of age increased with maternal age up to 27 years. Child Language development at ages three and four years was associated with improvements with increasing maternal age, with scores for children of mothers aged 20 being lower than those of children of mothers aged 40 by 0.21 to 0.22 standard deviations. Increasing maternal age was associated with fewer socio-emotional problems. Children of teenage mothers had more difficulties than children of mothers aged 40 (difference 0.28 SD at age 3 and 0.16 SD at age 5). Reported parent/child conflict decreased as maternal age increased. The use of harsh discipline such as smacking was low for teenage mothers and highest in the mid-twenties, after which it declined. Positive and responsive parenting generally increased with maternal age up to about age 40 after which it plateaued. The least home chaos and the most stimulating home environments were identified for mothers in their early 30s. This research, funded by the Wellcome Trust, was initiated in the knowledge that maternal age was increasing in the UK. 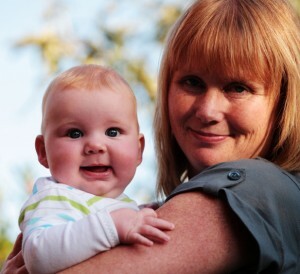 It has demonstrated that, while there are many medical reasons why close attention should be given to the physical well-being of older mothers and their infants both during pregnancy and immediately after birth, an increase in older motherhood should not necessarily be a cause for concern in relation to subsequent parenting. Indeed, it is likely that older mothers will be preparing their children well for preschool and school experiences in a warm and responsive home environment. The findings of fewer unintentional injuries with increasing maternal age and fewer child socio-emotional problems may suggest that women with more life experiences may be able to draw upon a wider range of support that can help to reduce some of the stress of parenting. These studies are important for any families undertaking IVF or other forms of assisted conception, who are on average older than other first-time parents, and for women who have delayed motherhood, for whatever reasons. Barnes, J., Gardiner, J., Sutcliffe, A.G., Melhuish, E. (2014). The parenting of young children by older mothers in the United Kingdom. European Journal of Developmental Psychology, 11(4), 397-419.